Number 101 on the Messier list of "not comets", this large spiral galaxy fits nicely into my FOV. 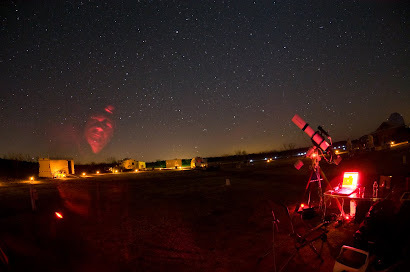 I shot this last week on my second night at the 3RF Comanche Springs Astronomy Campus (after Markarian's Chain). In addition to the standard LRGB data (color and luminance), I also shot through a Hydrogen Alpha filter to capture the bright red "knots" of star formation going on in the spiral arms. Look closely and you can see many more galaxies in this shot! 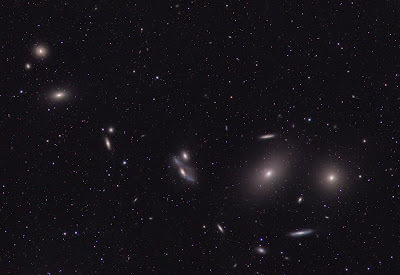 This is a galaxy group called "Markarian's Chain" that is part of the crazy massive Virgo Cluster of galaxies. Like our Milky Way, each of these galaxies has hundreds of billions of stars... and there are billions of these galaxies. Dang! I photographed this galaxy cluster last week at the 3RF astro campus in West Texas. As you may know (or not), the Sun goes through phases. Solar activity rises and falls over a relatively predictable 11 year solar cycle. 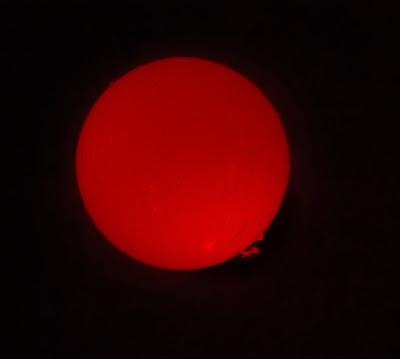 When activity (flares, sunspots, prominences, etc.) is at a low, the sun is said to be at "solar minimum". When it is at a peak, it is said to be at "solar maximum". After the last couple of years of relative non-activity, the sun is now heading towards solar maximum again... the sun is waking up again! A couple of days ago I was at the 3RF's astronomy campus. Jeff Barton, the astronomy director there, set up his solar scope and we watched this HUGE prominence. Jeff suggested I try to image it and so I did. This is my first attempt at solar imaging. I just mounted my Canon XSI camera to Jeff's refractor and fired away. It was really fun. So here is a single exposure at ISO200, 1/1000 sec. Be sure to click the thumbnail for a BIGGER look. 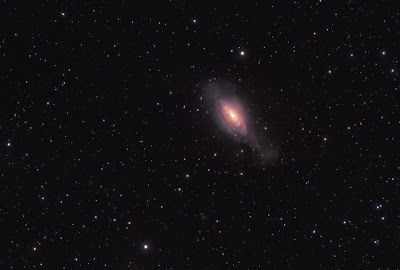 This is a galaxy in Leo called NGC 3521. 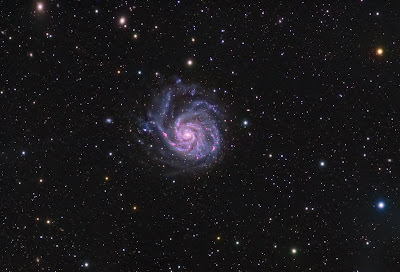 I imaged this with my new TEC 140 scope, which is capable of pulling out some of these "smaller" galaxies. The cool thing about this target is I did not know much about it, and had seen only a few examples. 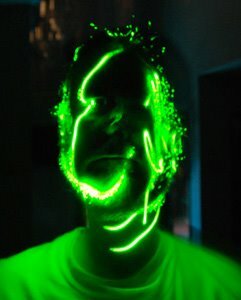 The images I DID see merely featured the core. So I was a bit surprised and excited to see these cool stellar clouds surrounding this galaxy that I had never seen before! I showed this image around and discovered it was indeed rarely imaged this wide/deep but certainly had been imaged before. In fact, the stellar cloud is referred to as the "hammerhead" because of the hammerhead-shaped formation in the lower right.